Now that Dex is on the move, I am becoming increasingly concerned for the number of brain cells he has left. He has had that many bumps, falls and bruises crawling around our poky flat that I decided enough was enough; we had to get out and cruise around a soft play instead. I had previously taken him to soft play at Dingle Lane Children’s Centre, but the room is a little on the small side and can get a little cramped, so I had a quick google and found Yellow Sub. Once you enter the main arena, there are two separate sections; one for 0-4 year olds and an older kids section with bigger slides. There is a cafe serving hot food and drinks and plenty of table and chairs to sit at. 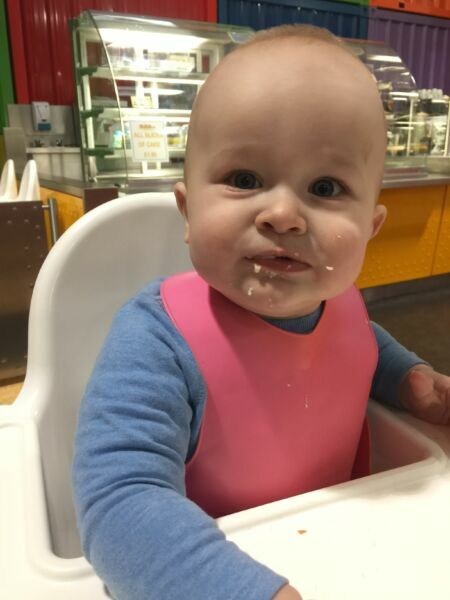 There are many highchairs available which means you can feed baby a bit of lunch inbetween playing. I love that the highchairs are the Ikea ones which are perfect for baby led weaning. The area for the little ones is fab. There are plenty of soft mats, slides and climbing areas. There is a small area where slightly older kids can ride bikes and there are lots of giant Lego blocks for building towers. Dex loved crawling over to the mirror to look at himself and pull himself up onto the blocks that are scattered around. The play area for the big kids looks even more amazing, but we will have to wait a few years before we have a go at that. I was so impressed with the cleanliness of Yellow Sub soft play; the toilets were spotless and the play area was really clean. The staff are really lovely and explain everything when you first arrive. There is also a baby changer which is imperative when you have a baby that wants to poop eight times a day! 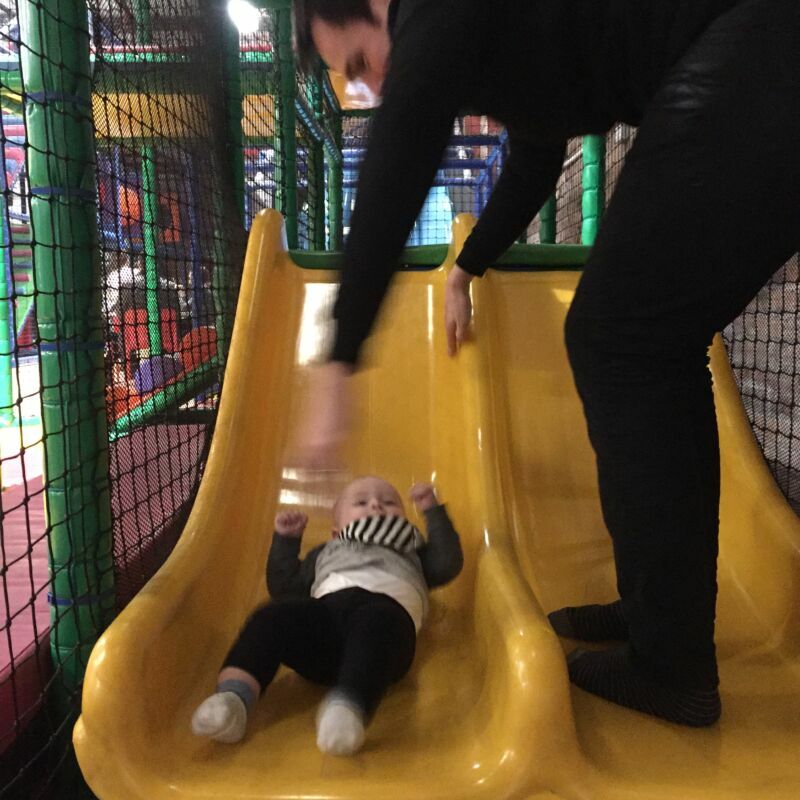 I absolutely love Yellow Sub soft play and will be taking Dex as often as I can. 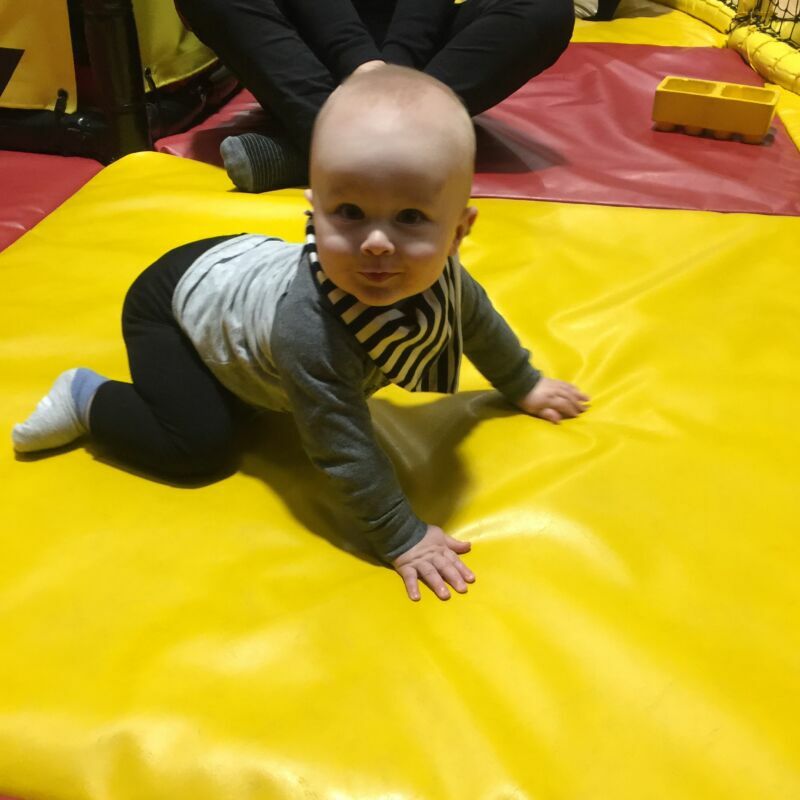 I think it’s an absolute steal for only £1.95 for the two of us to enjoy soft play for an hour or two and it’s great knowing that he can toddle off and I don’t need to worry about him banging his head! This has inspired me to check out soft play around us now!! So glad the pink bib made an appearance too – the Bibado one is nice but Dex and pink go together so well!